Teach on Mars just underwent serious refueling and is set to proudly accompany you along the digital learning highways that beckon in the outer reaches of our galaxy! This latest round of funding, announced on January 24, 2019, has been conducted with Omnes, Région Sud Investissement (advised by Turenne Capital) and the company’s existing investors. It will see Teach on Mars enter a completely new phase of its growth, consolidating its position as European champion in the mobile learning sector with the explicit objective of leadership on a global scale. Firstly, it will continue extending its international presence, primarily though the formalisation of Value-Added Reseller distribution partnerships in Europe. Secondly, it will accelerate its programme of partnerships with providers of premium mobile-first learning content. This will strengthen its unique offering of multilingual learning resources specifically designed for deployment in a connected, mobile learner experience. Finally, it will maintain an aggressive R&D policy in order to consolidate its technological leadership. This will specifically include further investment in the development of smart algorithms leveraging the latest advances in artificial intelligence. These algorithms hold the key to significantly reducing the cost of creating and indexing learning content. They will also enable radically enhanced competency and performance management through the automatic construction of ultra-personalised training paths based on real-time semantic analysis of the needs, progress and learning preferences of individual users. “We are delighted to join forces with Teach on Mars for the coming years. Omnes truly believes in the power and the relevance of a mobile-first experience when it comes to the digital learning space. The impressive execution so far by Vincent Desnot and his team led us to support their international expansion plan as well as their product roadmap”, says Xavier Brunaud, Investment Director at Omnes. 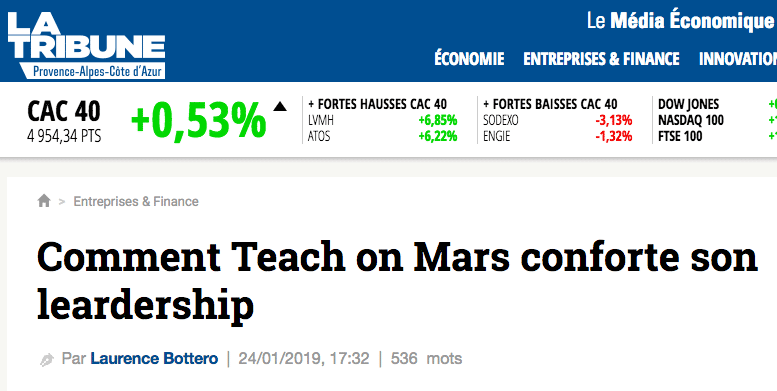 “An undisputed pioneer and leader in the fast-growing mobile learning marketplace, Teach on Mars has rapidly succeeded in convincing more than 50% of France’s CAC 40 companies thanks to the quality of its solution. We are proud to support Vincent Desnot through this new growth plan designed to reinforce the company’s international presence and consolidate its dominant position”, states Marie Desportes, General Partner at Turenne Capital. After 15 years in marketing and communications for international groups, Clotilde works on Teach on Mars’ cosmic radiation as its Brand Marketing & PR Officer.